How many of us would have believed at this time last year that we'd see 7 goals in one game by our beloved, but all defense team? Even after Tortorella took over last year, it appeared the team was having trouble shaking off the ghosts of Tom Renney. With the full season and challenge to the players to come to camp in shape, Tortorella has hit the ground running on his first full season and it shows. It didn't take long for our boys in blue to jump on the struggling Toskala and a Toronto team that's been winning a few fights but hadn't won a game yet. Ryan Callahan's scrappy nature in the crease paid off (with a little help from a Toronto D-man's stick) as he gets credit for the first of many dirty goals triggered by offensive pressure. Callahan's tally wouldn't be the only in the first period as Wade Redden (yes, Redden. That's not a typo) scored his first goal of the season as he dropped down from the blue line and received a pass from Prospal. See Ranger Fans, aren't you ashamed now for riding him the way you've been? Wasn't that worth $7 million to you?!?!?!? yeah me neither... All kidding aside, I think Redden has made some strides this season and a little time under Torts seemed to help him raise his own expectations. Perhaps the offensive style will help him rediscover his game as he'll be able to shed the expectations of scoring point man. The two point cushion perhaps set the stage for what happened next. 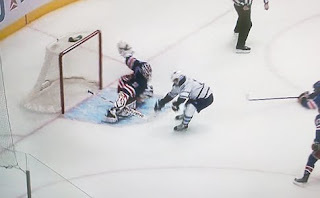 The Leafs would come back to score with 35 left on the clock in the first period after a Toronto player crashed the net and took down Lundqvist. Taking advantage the Ponikarovsky shot over the rising Lundqvist, put Toronto on the board and made it a one-goal game. The Blueshirts would extend the lead again on a Girardi shot off the face win in the first minute of the second period but were then perhaps caught off guard as the Leafs started to apply pressure 5 minutes in, taking the body hard and putting to use much of the muscle they acquired over the summer. Brilliant saves by Henrik Lundqvist help maintain the lead, but "The King" would eventually fall short once the physical pressure the Leafs had been exerting down low would pay off in 2 consecutive man advantages; the second saw Jason Blake squeeze a shot under the arm of Lundqvist at the right post. The Leafs would get one more man advantage before the period ended, but couldn't convert. The third period was all Rangers and saw us go up 4-2 on a good second effort by Sean Avery with assists by Drury and Anisimov. It would just take seconds for the newest big gun on Broadway, Marion Gaborik, to net his fifth of the season as the Blueshirts battled down low to turn the tables on the Toronto team that was now on their heels. Another goal by Kotelik was quickly overturned after a replay showed a distinct kicking motion. However the opportunity for Kotelik who was recently bumped to the forth line (to accommodate the returning Avery)and Brian Boyle taking a huge hit, highlighted some extra work that the 4th line got in the third period. 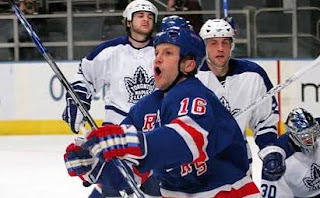 In fact, later in the period we'd see everyone from Brashear to Boyle see some power-play time, but not before Dan Girardi would get his second of the game after a puck popped loose from traffic down in the crease and the defenseman took the big wind up. After Jason Blake became the 3rd player to 'accidentally' dive and tackle Henrik Lundqvist, Avery had enough and started to physically remove Blake from his goaltender and would further make his point scoring the goal on the power-play.... while Blake looked on from the penalty box while serving for goaltender interference. This one would end 7-2 in the Rangers favor. Now before we start clearing a place on the mantle for the Cup, let's keep in mind this is a Toronto team that hasn't won a game yet and bet practically all it's chips on muscle and knuckle-draggers this off-season in the off-season. Their recent acquisition of Kessel from Boston being a moot point since he's injured. That being said, this is clearly a different Rangers team than it was a year ago. A season ago, we'd be lucky to get 7 goals in 4 games. Tortorella has clearly lit a fire under this team. Though they probably hated the work, the team seems to be loving their better conditioning. I also have to add that its presently surprising to see Marion Gaborik with his rumored glass hip, not shying away from contact but trying to get into every play. Vinny Prospal's intent to make Tampa Bay 'eat crow' may also become a self-fulfilling prophecy. As much as I have rather not have been willing to admit before... Even Brashear is showing more dimension that his usual hug and pug style. Kotelik, the guy many accused of us of getting just as a catalyst for our captain, is rifling pucks toward the net power play.